The Pink City is Jaipur. The pink party is K Chandrasekhar Rao’s Telangana Rashtra Samithi. But pink is the colour of the politics of Uttar Pradesh. It has always been so. On a fine Monday, the ‘Priyanka Sena’ just happens to be a ‘pinkish’ reminder of that truth. We will come back to the Priyanka Sena later. First, the colour of politics: acceptance of pink as a more feminine colour and blue, on the other hand, as a masculine one goes back a long time in history. There are various conspiracy theories about how pink is actually a stronger colour than blue. But somehow, the practice has been left unperturbed for the greater good. When the Economic Survey was printed in pink in 2018 to highlight gender issues, there was a clamour. But no one holds a serious grudge against any colour, we'd like to believe. Now, welcome to Uttar Pradesh. 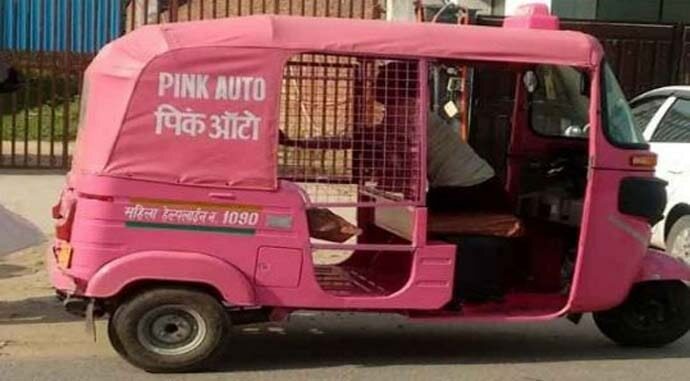 Roads in Noida as well as Greater Noida are dotted with pink autos meant for women passengers only. In 2015, an all-women Pink Express bus route was launched to connect Lucknow and Anand Vihar. Yes, pink is the colour of Uttar Pradesh. And Mayawati alone should not be blamed. 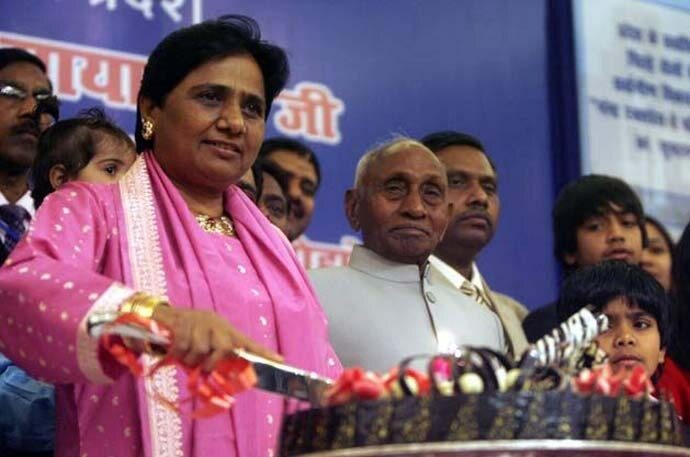 Mayawati’s favourite colour is pink. Mostly, she wears pink kurtis. That is not the point. Her 13 Mall Avenue Bungalow in Lucknow has a two-storeyed guest house with 14 bedrooms. All these rooms apparently have pink Italian marble flooring. Notice her birthday cake. It has to have some pink in it too. In 2010, UP’s Gulabi Gang — an all-women vigilante group, which wore only, you guessed it, pink — came into the limelight. 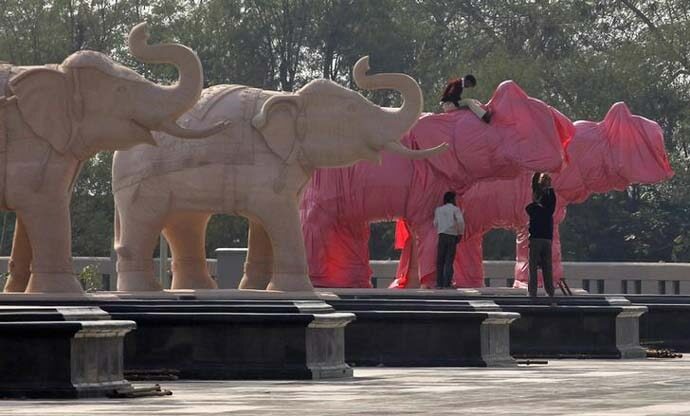 The Rashtriya Dalit Smarak at Noida has 24 elephants made of pink sandstone, which reminds us of something funnier. Ahead of the 2012 UP Assembly Election, the Election Commission issued an order to cover all the statues of Mayawati and elephants in UP. The colour of the plastic sheets used was pink. We don’t know whether Akhilesh used to see pink instead of red. But he mentioned the 'pink revolution' indeed in his speeches. It was in the aftermath of the Akhlaq lynching case that the-then-UP CM challenged the Modi government to ban beef exports. "Some forces want to vitiate the atmosphere of secularism. They want to rake up such issues. These forces talked about the pink revolution. You are in government now — so ban beef exports. You should build support for banning their export," he had said. A lot has happened between that time and now. 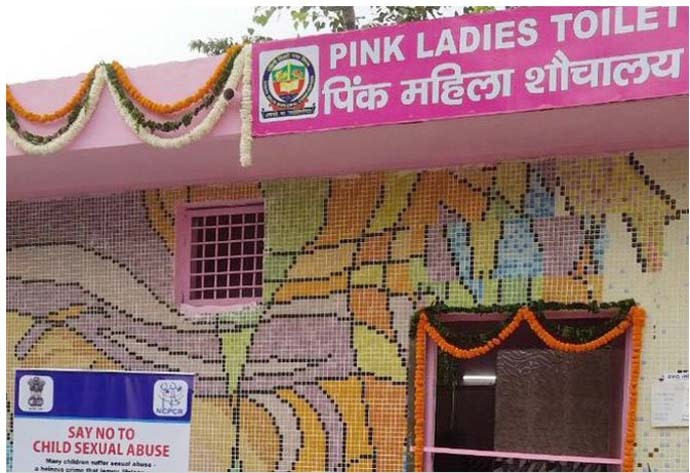 The Yogi government has gifted UP with its first pink toilets containing sanitary napkin vending machines (though we are quite sure pink is not Yogiji's favourite colour). Then came the day when pink-clad men poured onto the streets on the occasion of Priyanka Gandhi’s first roadshow in Lucknow, the UP capital. They are the 'Priyanka Sena'. 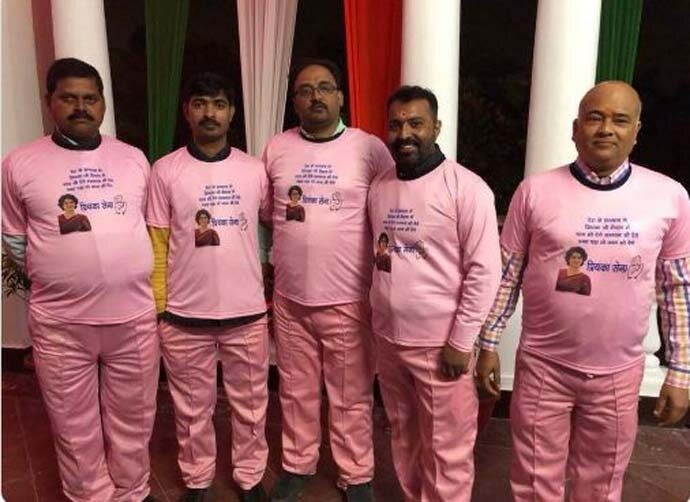 They will fight for Priyanka Gandhi even if they go pink in the face. We don’t know whether Priyanka would be able to touch the right chords. But she has touched the right colour. We don’t mind pink (unless it’s a slip).